Biodegradable hot drink cups look and feel like traditional disposable hot drink cups, but with one important difference. These new generation hot drink cups are manufactured using biodegradable materials. Hot drink cups have become very much part of life over recent years. The advent of coffee shops selling coffee in disposable cups for people to drink on the go has meant that the number of hot drink cups that are disposed of each year has increased significantly. One of the challenges that hot drink cup manufacturers have faced is how to make a cup that performs well and is also biodegradable. Traditional hot drink cups have a lining that is made from petroleum. This lining helps to insulate the cup as well as to protect the paper cup from the hot liquids. This lining makes the cups impermeable to liquids. If hot liquids are allowed to soak into the paper, the cup could break. This petroleum lining has been an important part of hot cup production. 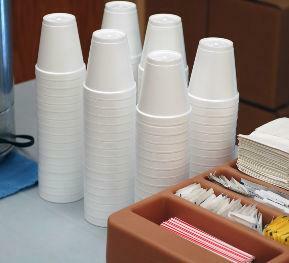 Biodegradable hot drink cups have been developed using a biodegradable coating. This coating is often made from plant extracts and has been designed to be fully biodegradable or compostable. One of the benefits of this type of lining is that it is made from a completely renewable resource as well as being compostable. Many coffee shops, cafes and other hot beverage providers who use biodegradable drink cups and other containers will promote this fact. Some offer customers the biodegradable containers as an alternative to traditional containers, thereby giving their customers a choice. As well as the use of biodegradable and compostable hot drink cups that are used in cafes and coffee shops, it is also possible to buy biodegradable and compostable drink cups for home use. In addition to biodegradable cups, many hot drink sleeves and lids are also biodegradable. Many companies offer a printing service and coffee shops and other outlets can have the cups branded if required. While biodegradable hot drink cups are kinder to the environment than the traditional alternatives, they still create waste which will take time to decompose. There is also a cost in energy in the manufacture and waste collection and disposal of disposable cups. An alternative is reusable hot drink cups. Many people opt to carry a mug with them that can be filled with coffee. This mug can then be washed and used over and over again. Hot drink cups are just one type of food container which is biodegradable. Most types of food packaging is available today with a biodegradable option. This includes salad containers, plates and bowls and even cutlery. This wide range of options combines the flexibility of eating away from home with a need to reduce the amount of waste that ends up in landfills. Biodegradable materials will compost over time and their negative impact on the environment is less than traditional products. Biodegradable and compostable hot drink cups, plastic bags and other food containers are just one way of helping the environment. Every step that we take, however small, can contribute to making a positive change on our environment.